← Two wrongs don´t make a right! I imagine it´s rare that one can repost the same post on a subject 18 months on. But this is one such occasion. 18 months ago I wrote this post as a comment on an op-ed piece by Charles Johnson. This time it is to counter an op-ed (also on the WSJ) by Amity Shlaes (who just published a book on Coolidge). Since both Johnson and Shlaes use the same arguments, I´ll keep the same post (except for the title)! The intellectuals shy away from “pedestrian” debates and choose “demons” and “idols”. While Krugman chooses to “demonize” Reagan, Charles Johnson chooses to “idolize” Calvin Coolidge. The correspondence with the ongoing debate about fiscal policy is very clear. But rarely there are “demons” and “idols”. In a couple of posts (here, here) I argued that Krugman “distorted” history in order to lambast Reagan (“representative agent” for those who wish for small government). I´ll try to show that Charles Johnson “distorts” history to “idolize” a “representative agent” of another epoch for the small government group. Eighty-eight years ago this week, Calvin Coolidge took office upon the sudden death of President Warren Harding. Like the current administration, the Harding-Coolidge administration faced a tough recession from 1919-1921. But unlike the current administration, the Harding-Coolidge and Coolidge-Dawes administrations cut taxes, balanced budgets and slashed government spending, reducing federal debt by over a third in a decade. What a hero! And note that he´s known as “Silent Cal”! It´s Hard to believe that a politician would work in “silence”. But never mind, Johnson makes attributions that are just not true. Figure 1 shows that when he took the oath the war deficit had already disappeared and had turned into a small surplus. 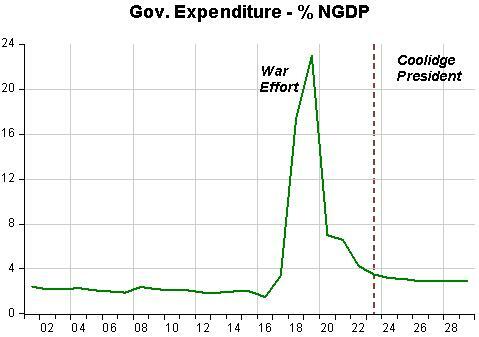 Figure 2 shows that just as taxes had had gone abruptly and sharply to finance the war effort, they just as sharply came down after the war. By the time Coolidge became president all the “work” was already done. 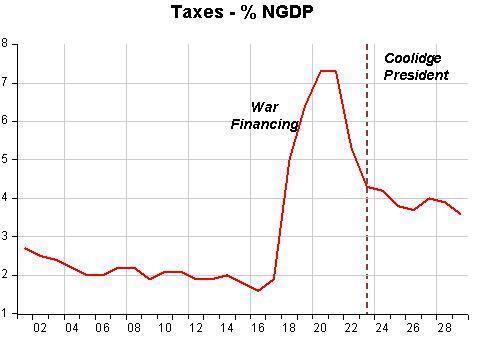 But notice that taxes didn´t fall to the pre war level. The same argument holds for government expenditures seen in figure 3. And the economy only grew by 3.3% on average from 1924 to 1929, not 7%! The strong growth took place in 1922 and 1923 as the economy bounced back from the 1920-21 recession. 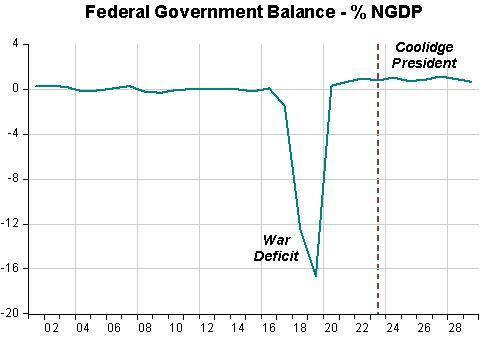 “Fiscalists” will say that the 1920-21 recession was due to government expenditure falling from 23% of NGDP in 1919 to 7% in 1920.The problem is that they continued to fall reaching 3.2% in 1924 and averaging 3% from then until 1929, but the economy rebounded smartly. Krugman doesn´t mention monetary policy much. After all we are in his “beloved” liquidity trap (and Bernanke is not “manly” enough to increase inflation expectations). Johnson says the “roaring 20s” was all due to “slashing taxes, government spending, etc.” Not a word on monetary policy. But let´s look closer. During the war, everything “took off”. Be it Prices, Nominal Spending (NGDP) or RGDP. When the war ended, prices and NGDP continued to rise but RGDP began to retreat. So the Fed tightened MP. NGDP, Prices and RGDP dropped immediately, the prototype result of an Aggregate Demand shock. The set of figures below illustrate. Note that money (M2) growth and velocity fell steeply. But who was responsible for the 1920/21 recession. Could be both MP & FP. But what comes after allows us to put the “blame” for the recession and the “cause” for the recovery square on the shoulders of MP. The following set of figures show the strong rebound in NGDP and RGDP in 1922/23, before “Silent Cal” took office. Prices rebound slightly (1.8% inflation on average from 1922 to 1925). Look at the picture of money growth and velocity. Just as the money velocity picture for 1919/21 explains the observed fall in NGDP (RGDP and Prices), this one explains the steep rebound in 1922/23. From 1924 onwards nominal and real growth fall back to 3.3% on average with prices stable. In 1927 monetary policy failed to compensate the fall in velocity. Real growth dropped close to zero and there was a slight deflation. “Silent Cal” didn´t manage monetary policy which I showed was responsible both for the recession and the recovery. Maybe if, like FDR (who dictated monetary policy in 1933 and got a recovery on the way), he had decided that the government share of the economy should increase (with something along the lines of New Deal policies) the “roaring 20s” would not have been. But to “Fiscalists” the “Great Depression” was the “natural consequence” of all that “laissez-faire”, much like the present day (now) “Second Great Contraction” is the “child” of all the “laissez-faire” that was disseminated during the “Great Moderation”. Like Roberts, I am skeptical about the ability of discretionary fiscal policy to stabilize the business cycle. His critique, however, is too quick to embrace the popular view that fiscal policy consolidation actually improves the economy. On this point, Krugman is correct that most of the empirical evidence (e.g. here,here, and here) does not support this view. What the evidence does show is that in most cases where fiscal consolidation was accompanied by a robust recovery it happened because monetary policy was accommodative. In other words, a loosening of monetary policy made it appear that fiscal policy tightening was the cause of the economic recovery when in fact it was not. The prosperity of the 1920s appears much like prosperity of the “Great Moderation” where a supply-side focused fiscal policy enhanced productivity was combined with a loose monetary policy guided by an emphasis on price level stability provideda toxic mx leading to a significant boom-bust cycle. Should be a cautionary tale for those enamored by the promise of nominal gnp targeting. Mises’s Liberalism coupled with Rothbard’s wisdom is a better guide to truly free and prosperous commonwealth than the policies of either Reagan or Coolidge. This is an ongoing habit among academics. Take some country, or President, and invest that country or President with attributes that explain economic success. Those attributes are, of course, the ones that fit one’s political agenda. But Nunes is right. Why bother talking about the 1920s, or any other era, without explaining monetary policy? Petty comment: Amity Shlaes is awful. Thanks for this repost. Although I wish it were directed at her, your criticism of this fiscal obsession by her and Mr. Johnson is on point. BTW, I HATE it when laypersons try to blame Roosevelt and his “evil, socialist programs” for extending ir causing the Great Depression, as I believe was her thesis in that other awful book.